Join the One Year Bible Reading Plan! In the New Year I've opened up my daily Bible reading through the One Year Bible reading program, and you're welcome to read along! I'm planning to post notes and answer questions as I have time. I'd love to have you join us on the journey. Here's my first post, inspired by a teaching by my friend, David Sanborn: Jesus is mentioned in the very first verse of the Bible! You just have to understand Hebrew and the Hebraic mindset to see it. This article will help. Hope to see your comments and questions starting tomorrow! Have a blessed New Year, everyone! There are four openings for the 2019 Rocky Mountain Christian Filmmakers Camp. ...or at least from a few blocks away in the warmth (and dry) of our apartment. But we were on Times Square last night as they were setting things up for tonight's festivities. I recorded some very exciting news there: Registration is open for the Rocky Mountain Christian Filmmakers and Actors Camp! You'll get the main training in video tutorials before arriving, so that as soon as you hit the ground, we'll be running into film production. You'll leave with a short film for your reel, headshots, and (if it's like every year so far) you'll have an opportunity to audition for a live professional project. Also, many projects want you to have taken a film etiquette course if you don't have a certain amount of film projects under your belt. That happens to be one of the film tutorials, so you'll be able to check that box! We opened registration up to alumni first, so two spots are already taken on both sides of the camera. Move swiftly to secure one (or more with friends!) of the other four spots for each program: www.ChristianFilmmakersCamp.com. The intimacy of the program means there's lots of opportunities to grow as an artist and as a Christian. Also, there is an early bird savings of $100 through the end of January, so if you don't have time to register now, be sure to set an alarm. There are a lot of great lines in Where Hope Lives, written by Marco Santiago (actor in "Colonel Papa Cubano"). My very favorite came after the show by Pastor Carter Conlin, who gave one of the best summations of Christmas I've heard: "Unapproachable Light (1 Timothy 6:16) wrapped Himself in the most fragile form of humanity." Marco and Courtney Menking (Henry Box Brown, Celebrity Confessions) play the parents of an adopted daughter and birth son, who invite two foster kids to live with them. Patricia ("Colonel Papa Cubano" and Courageous Love) plays Florence, the pre-believing social worker who sets up the foster relationship is astonished at what the help of Jesus achieves. Mark Steele (Celebrity Confessions) plays the stern principal, who sets up one of the most touching scenes. Adrienne Breland (helped with the production of Fire Off-Broadway) had a poignant scene in which she plays an admitting counselor at an abortion clinic with a girl played by her granddaughter! The way they resolve the scene is electrifying! Ronalda (Off West Broadway productions), played the birth mother in a heart-wrenching scene. Pastor David Ham (who used to perform at The Lamb's Theatre) introduced the production and had a hand in directing it, alongside Marco and Patricia. They've done a great job, especially with the younger actors. The gal who played the protagonist of the story, the foster daughter, had a major character arc and carried it off with brilliant nuances. Justin Hullinger (who got his start at The Lamb's Church) did a great job with the lighting. You can watch it online through Sunday at www.TSC.NYC. Click on the image for the 10 AM or 3 PM services. See the rest of Olympic champion Eric Liddell's Chariots of Fire story in Beyond the Chariots. Watch it online and book a live performance. Dr. Linda mentions that there are hundreds of prophecies that were fulfilled by Jesus Christ. Here are more prophecies and how Jesus fulfilled them: Bible Prophecies Fulfilled by Jesus. Between the Scripture readings and Pastor Linda's teaching, we sing carols that celebrate the fulfillment of those prophecies. In the service we sang to modern adaptations of classic carols, but our CCLI license does not allow for sharing recordings of copyrighted material online, so because the carols were such an integral element of the service, I recorded carols that are in the public domain. If you'd like to sing along, click this link for the lyrics. Pastor Jim Warren opens and closes the service. Rocky Mountain Christian Filmmakers Camp is about to announce that our registration has opened. Sign up so you don't miss it. This morning at Westchester Chapel, Joyce teaches on Matthew 1:18-25. Matthew, the despised tax collector, lived a life of shame, and he highlighted the great shame Joseph took upon himself by marrying a woman who was already bearing a child not his own. Joyce mentions Views of the Manger, my play, and two stories it portrays: Joseph's choice of obedience (today's main passage) and Abram nearly walking between the cut animals when God promised to be the Covenant Keeper (Genesis 15). She also told the story of her heart failure in 2005. You can visit the blog we kept during that frightening season. Dr. Linda Warren opens the service, and Melanie Solomon reads Luke 1:30-33. You can see one story from Views of the Manger as performed just beyond the door to The Manger in Bethlehem at www.RichDrama.com/ViewsOfTheManger. Joyce and I presented plays and teachings in eight nations throughout Europe in August and September. Later, Harald Sørlie, who produced Rich's performance of I Dreamed I Was Free in Oslo, visited New York City. We met with him and Danielle Campbell, who introduced us to Harald, at the restaurant where it all started. We talk about that first conversation that blossomed into an eight-nation tour... and about the sounds animals make in Norwegian. Press the arrow below, or if you're getting this in an email, visit www.Blog.RichDrama.com. I Dreamed I Was Free, which Rich performed in Oslo, is available anywhere in the world. It tells the story of Quaker abolitionist John Woolman, who spoke against slavery a century before our Civil War in America. set of "Milk and Oranges." McKenzie Harris and Rachel Marley were my students together at the Rocky Mountain Christian Filmmakers Camp (RMCFC) in 2016, where we produced the short film "Milk and Oranges." This January, McKenzie was in charge of wardrobe on the set of "There," which was written, produced and directed by William and Morgan Willer, two other alumni of RMCFC (2015 and 2016). In the middle of production, McKenzie got a call-back for the lead in the Lamplighter Theatre production of The Treasure of the Secret Cove. As an alumna of RMCFC she received the casting call I sent out to all my former students. The Lamplighter production team listened to over 250 auditions without considering who the actors were. They were shocked to discover McKenzie was also an alumna of the Lamplighter Guild (2017), where I got to teach this summer, as well as Lamplighter Live, where I first worked with her. McKenzie discovered that Rachel was cast as her character's best chum in the production. Our friend and colleague, Nato Jacobson, plays the husband of McKenzie's character. David Sanborn, a friend I've worked with on projects since 2001, plays a mysterious visitor. Nato and Rachel also played smaller roles. Joyce and I just listened to it, and they all did splendid work! So many nice moments. So much truth spoken so eloquently. It's a wonderful story, based on the classic book of the same title by Amy Le Feuvre. It's about the power of the covenant of marriage, and it's set up in a very creative way! You can order it as a set of CDs or download it now. I was honored to be a consultant on several elements of preproduction. We're about to announce that registration is open for the Rocky Mountain Christian Filmmakers Camp. Sign up for the announcement. The Lamb's Church, circa 1994. I've now lived in New York City for 25 years. In 1993 I went from a 70 acre farm in Oregon to an 8.5' x 11' room in the Lamb's Church, which had two Off-Broadway theatres (though one was later registered as Off-Off-Broadway). It was close enough to Times Square that from the roof we could see the Macy's Thanksgiving Day Parade balloons float by. For my first New Year's Eve I stood for hours on Times Square during one of the coldest NYC days on record, and then I discovered the next day I could have walked through a parking garage next to the Lamb's Church at 11:55 PM and seen the ball drop! Later, a building was demolished that allowed us a view of the ball from the roof of the Lamb's Church. The first time I remember that happening was when we rang in the New Millennium. As soon as the ball dropped we all ran to our computers to see if they had crashed! Thankfully Y2K was greatly overrated. I kept a journal in those days called "Farm Boy on Times Square." You can read the first two entries by clicking here. A Clear Leading was the first feature-length play I wrote, and I performed it for the first time in 1994. It tells the story of Quaker abolitionist John Woolman, who spoke against slavery a century before our Civil War. We've changed the title to I Dreamed I Was Free, but the basic play is (after many adjustments) still basically the same. In a time when darkness, strife, and division seem to reign--very much like the time Jesus was born--we pray Joy to the World! Rich played Walter and served as acting coach, while Joyce was a key crew member, keeping actors warm between takes in "There," a short film that takes place during a rain storm! Joyce also played the mother of my character's daughter during a sociodrama to help her get ready for an emotional phone call, so we're counting Moriah's character as our 22nd screen child! You can watch "There" now: www.RichDrama.com/There. A 20-year prayer was answered, and Rich got to perform at Christian Cultural Center. Annual workshop at Princeton University, where we visited Jonathan Edward's gravestone which inspired a post about revival. Performed Jonah for a gang unit on Rikers Island. Performed in It's a Life Worth Living and The King's Messengers on the same day! That was a first! Later that month I performed several roles for The Adventum, a wonderful audio drama of the Book of Genesis, which is now available. Taught, coached and performed at the Rocky Mountain Christian Filmmakers Camp, where we produced "Return on Investment." Taught and directed at the Lamplighter Guild for Creative Disciplines. Performed in Denmark and Sweden on the same day! That was a first! Performed in Norway, Finland, Germany, Liechtenstein, Switzerland, and Iceland. Performed at the Hollywood Divine International Film Festival. Performed I Dreamed I Was Free in New Mexico, the 43rd state in which I've taught and/or performed. Another first! "Milk and Oranges" released, which was our film at the Rocky Mountain Christian Filmmakers Camp in 2017 and the directorial debut for Joyce. Joyce shared the Christmas Eve eve message at Westchester Chapel. Here's my prayer for the Mastermedia Christmas party, which is for us all... though we don't wish a broken boiler on anyone! Click the arrow below, or if you're getting this through an emailing, visit www.RichDrama.com/Christmas2018. 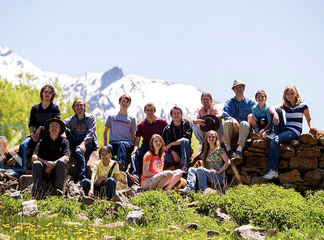 Registration is now open for the Rocky Mountain Christian Filmmakers Camp June 23-29. We finally sorted all of our photos from our trip to Europe this fall. You can find all the albums at www.SwinglesEuroTour2018.Shutterfly.com. were used for Rich's performance of Big Fish Little Worm that evening. ...and we had a shockingly great time in Norway. This church was our first stop on our tour of Helsinki. Ulrich Zwingli, in Zurich, St. Gallen, and Wildhaus, Switzerland. was actually quite warm in Iceland. You can perform at Carnegie Hall! This morning Joyce and I joined New York Media Initiative for breakfast with Keith and Kristyn Getty. What a joy to hear their passion for the Lord and for honoring the many biblical mandates to sing unto the Lord. Keith said it doesn't matter how well you sing, just so long as you honor the Lord's commands to sing praises to His name. During the Q/A someone asked them where they get their inspiration for writing songs. He said it's a lot of hard work. Hymnals used to only select songs the publishers thought would still be sung 25 years into the future, and that's what they strive to do. She added that Keith is a collaborator, and is quick to draw others into the process of taking their hymns to the next level. My question during Q/A was what they've picked for next year's global hymn sing. Last year I put together a short film of Olympic champion, Eric Liddell, reflecting on how he led the crowd at Waverly Station in singing "Jesus Shall Reign" before he left fame and fortune behind to serve China as a track coach, science teacher and missionary. I tell the rest of his Chariots of Fire story in my one-man play about Liddell, Beyond the Chariots. I was glad that, after their talk, I got to tell Keith and Kristyn about the short film and give them the link (www.RichDrama.com/EricLiddellHymnSing). Keith is a huge Eric Liddell fan, and that may be why he chose "Jesus Shall Reign," since he immediately acknowledged that he knew about Eric leading the crowd in that great hymn. The Gettys are performing at Carnegie Hall tomorrow night (12/13), and they'll be celebrating the 200th anniversary of the writing of "Silent Night" by having Phil Keaggy (who you can see in my Compassion video) play it on guitar. It was the first hymn ever played on a guitar, because the church's pipe organ broke down. They'll be inviting the audience to sing along, which is how you can perform at Carnegie Hall. Hope you can join us! If you're getting this as an email you can watch the video at www.Blog.RichDrama.com. Registration is about to open for the 2019 Rocky Mountain Christian Filmmakers Camp. Be sure to get the announcement. This morning I got to open our service at Westchester Chapel. Pastor Jim Warren preaches on John 1:1-14, one of my very favorite passages, pointing out the unique nature of this opening to the fourth Gospel. He mentions human attempts to altar life. You can hear more examples at Dr. Michael Guillen's talk at Mastermedia. He was ABC News Science Editor, and through that post he appeared regularly on Good Morning America, 20/20, Nightline and World News Tonight.